UNIVERSAL DESIGN: Made for all households. Fo use on a patio, in a garage, laundry room, entryway, and anywhere there is high traffic from outside. 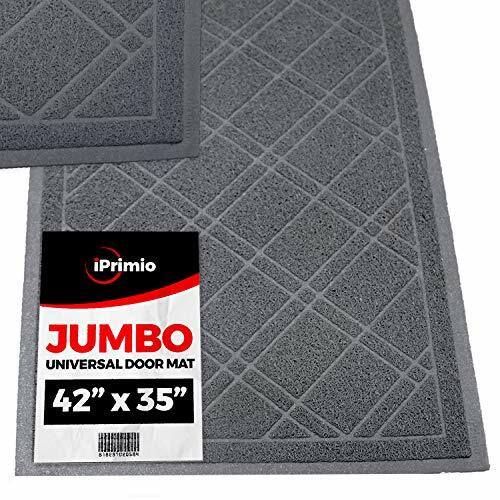 ANTI-SLIP & DURABLE - XL Size 41" by 35" Mat Mesh Captures dirt and debris. Provides cushion and non-slippery quality. WEATHERPROOF SURFACE - Mats are waterproof and moisture resistant. PHTHALATE & BPA FREE: Highest Quality outdoor / indoor mats, capturing dirt despite of using it for hours. UNIVERSAL DOOR MAT WITH DURALOOP: Exclusive Plaid Design that looks great in any house. For use on a patio, in a garage, laundry room, entryway, and anywhere there is high traffic from outside. ANTI-SLIP & DURABLE - XL Size 42" by 36" Mat Mesh Captures dirt and debris. Provides cushion and non-slippery quality. WEATHERPROOF SURFACE - Mats are waterproof and moisture resistant. Inside Door Mat or Outside Door Mat. If you have any questions about this product by SlipToGrip, contact us by completing and submitting the form below. If you are looking for a specif part number, please include it with your message.